carolabriney.com » It’s Time To Embrace Your Unlimited Possibilities! – Check Out The Special Limited Time Price! It’s Time To Embrace Your Unlimited Possibilities! – Check Out The Special Limited Time Price! For only $10.00 including shipping and tax. What a great gift for yourself and those you love! 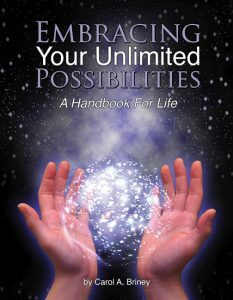 Embracing Your Unlimited Possibilities is an extraordinary handbook full of down to earth wisdom and useful insights that invite you to open your heart and mind to your authentic self. In this book, Carol A. Briney helps you to learn and truly understand that you are connected directly to Source and that your Spiritual path is something personal that should allow your soul to sing. The step-by-step exercises offer a road map that will help you realize your limitless potential for joy and happiness, thus allowing you to create the life of your dreams.